Before we start into the photos and locations, I think it would be helpful to share a few tips. Bring along your own camera or cell phone! While official Disney photographers will take your photo with their camera, the Disney Cruise Line character attendants are always willing to snap a picture or 2 for you using your own camera. Arrive 5 to 10 minutes early for popular character meets. The daily Personal Navigator and Disney Cruise Line mobile app will show you all the available meet and greet times for the day. DCL operates a little differently than the parks because you are guaranteed to meet the character if you get in line within the 15 minute block of time they alot in those forms of guest communication. However, you may face a decently long line for Mickey, Minnie, Captain Jack Sparrow and Tinker Bell on your cruise. Arrive a few minutes before the other guests and you can be on to the next meet while they wait in line. Get to know the Disney Cruise Line app quickly. Download the app before you sail, but understand it doesn’t work until you actually board your ship. You’re encouraged to switch your phone to “Airplane mode” and use “DCL-Guest” wifi mode. Using the application is free and requires no wifi packages to operate. I loved using the app and “Favorited” every character meet and greet and show I wished to attend. The app reminds you 15 minutes before any favorite activity. Have your autograph item and pen or marker ready before it’s your turn. Many guests wish to meet the characters and some only offer a few sets during the trip, so make the most of your time by having that pillowcase, shirt, photo, frame or autograph book ready ahead of time. Characters change costumes frequently. I found that the character attendants were very friendly and helpful. They usually know which costume a character will wear at which meet. Feel free to ask politely and they would love to help. I was able to meet 25 characters wearing 56 different costumes. I also saw Goofy roaming in 2 others, Dopey appeared for a family show and Donald Duck appeared in Mexican gear for my son’s group in Vibe. Others can pop into kids clubs. Reserve spots online. Some things like the Frozen meet and greet, Princess meet and greet and Disney Jr Breakfast require a FREE ticket to attend. You can sign up online after you complete your check-in procedure online. If you don’t sign up online, you’ll need to visit Guest Services when you board. The ONLY way to meet Anna and Elsa on the Fantasy was with the free ticket. The ONLY way to meet Mickey in his class Red Pants and Black jacket tuxedo is the Disney Jr Breakfast. Princesses (Ariel, Belle, Cinderella and Tiana) do offer a couple of other opportunities for meet and greets and pop in late at night, but it’s super easy to meet all 4 with the the free ticket. Some characters offer special backdrops. Many meets take place at the base of the grand staircase, Deck 4 balcony just above or Deck 3 area in front of the large photo of Walt Disney. Some, like Tinker Bell, Princesses, Disney Jr and Woody/Jessie offer some unique backdrops that make for unique photos. You’ll see those detailed below. Feel free to dress up! Guests enjoy creating costumes that resemble the character costumes, wear tuxedos on formal night and dress like Pirates on Pirates in the Caribbean night. On special cruises from January-April, you can even meet Star Wars Characters. On cruises from September through October, you can wear your favorite Halloween costumes too! A Disney Cruise is a giant family party at sea, so have fun with it. Get your Castaway Cay photos BEFORE you relax on the beach. Characters are only out for a short time on Castaway morning and you’ll look your best before taking the big dip in the water, so use the first hour after the ship opens for debarkation to meet all the characters in their fun swimwear. If you miss any characters in their Cruise Line costumes or Princesses, you can catch some of them during “See Ya Real Soon” which happens twice on Castaway Cay day. If you visit both, you’d have no problem seeing them all. The first one is far less attended that the last one. NOTE: There are NO Disney photographers for “See Ya Real Soon!” You’ll need to bring your own camera, but the character attendants will take your photo. If you wish to have a Shutters photographer take your photo with Cruise Line costume characters and Princesses, do so earlier in the trip! Characters may vary. While I saw certain characters and costumes, your experience may vary. Your cruise might include Snow White or Aladdin or Disney may add new characters. I was able to meet characters in Patriotic costumes, which you’ll only see on the 4th of July. Go with the flow and meet as many as you can and in as many different costumes as possible. On to the photos and details! If you enter the cruise terminal in Port Canaveral before 2pm, you’ll likely bump into one of the Disney Cruise line character VIPs who appear next to the scale model of a Disney cruise ship. In our case we first met Mickey Mouse as Captain Mickey. When you complete your check-in online for your cruise, you are provided a time to board the ship. Even if you are given a later time, you can still enter the terminal and take care of your paper work and photo. While waiting around to board, get some great photos with characters! In addition to Captain Mickey, we were able to meet Cruise Line Hostess or First Lady Minnie! You’ll see them in these costumes several times on a 7 day Fantasy cruise, but it’s still a fun photo. We are all checked in. You’ll use your “Key to the World” extensively during the trip to board and disembark the ship and make any charges to your account. Disney Cruise Line ships are “cashless” and do not accept cash for any purchase. You might want some for spending money in Caribbean ports. All Caribbean ports accept American dollars. 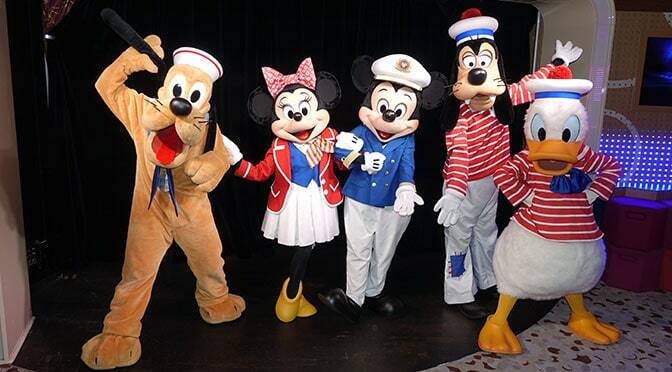 After the Sail Away Party on Deck 11, you’ll find the characters begin meeting guests. Mickey and Minnie rotated at this backdrop on Deck 3. This location will always be called Lobby Atrium H and is right next to the long hallway toward the Aft (back) of the ship. Goofy and Pluto rotated at the meet that is marked as “Preludes” on Deck 3. As I mentioned above the “Preludes” meet is actually right in front of Uncle Walt. I met Mickey, then Minnie, then Goofy, then Pluto a little later on. Pluto appeared as a sailor. Belle appeared for only 2 meets on the first night in her Blue “Provincial” Dress. She was meeting on Deck 4. Belle appeared at 7:45 and 9:30pm. Be sure to pick one of these 2 sets to visit her in this attire. The rest of the trip I only saw her wearing the Gold Ball Gown. Continue below by clicking upon Page 2! Thanks for all the info. We sail Feb 23 on the Fantasy with a Star Wars Day At Sea. I’ve booked Chewbacca, R2D2, C3PO, and Darth Vader. Can’t wait. Heads up though. The photo package on the Disney Cruise Line is astoundingly expensive compared to Memory Maker, and in many ways inferior, such as unremovable borders. I’m using only my camera for photos the whole cruise this time. Do you know if there’s characters in the kids club? I’m going really soon and since I’m 16 I’ll be in the teens club the vibe! I really want to spend time with a character and not just have a long wait to have a 1 minute conversation with them! Characters do pop up in kids clubs from time to time. Lines on ships aren’t that long. Maybe 15 minutes. We took this same cruise in April. It was our first cruise and we really enjoyed it. I wish I had this review before going bc we missed out on our Castaway Cay pics with the characters! Kenny, do you know if the transatlantic cruises have more or different characters? We are headed out on the Barcelona to New York one in September. Thanks!!! On the Halloween cruises, do you know if they have any special characters such as any villains ? Just Disney classic characters in costumes. And Jack and Sally as well. Do Jack & Sally actually sign on the cruise? Thanks! Some appear for the deck parties as well. Is your day 6 costume info correct? Don’t the VIPs wear formal costumes on night 6? You’re correct. I had that in error and fixed it. This is awesome! We are sailing this exact cruise in February, and reading your updates and seeing all of the fantastic pictures makes me even more excited! You’ll get Star Wars Day at Sea, which is your last Sea day too! We went on the fantasy last sept and loved it! The character team literally made our trip! We were calling ourselves the toddler paparazzi because our three year old had to meet everyone and by the end they all knew his name. I’ll do an upcoming article detailing that for you. Thank you. This was great! I am going on the Fantasy in October and can’t wait. We will be able to get the Halloween costume meets, but I didn’t know about some of these others. We went on the Dream in December and got some great Christmas costume meets like Belle in her Christmas dress, Santa Goofy, and holiday beachwear at Castaway Cay. This makes me want to take a 4th of July cruise. Well you convinced me! Lol! A couple a questons- are there always that many characters? & if it’s Halloween cruise will they still do all outfits & just a Halloween night like July 4th night? Thanks! More photos!!!! I would like to see them all!!!! They are all there. Did you click on all 7 pages?